Sniper Ops Gun Dagger Knife & Sheath Black | BUDK.com - Knives & Swords At The Lowest Prices! Designed with the shape and feel of a handgun, this Sniper Ops gun dagger is one tough, mean dagger! 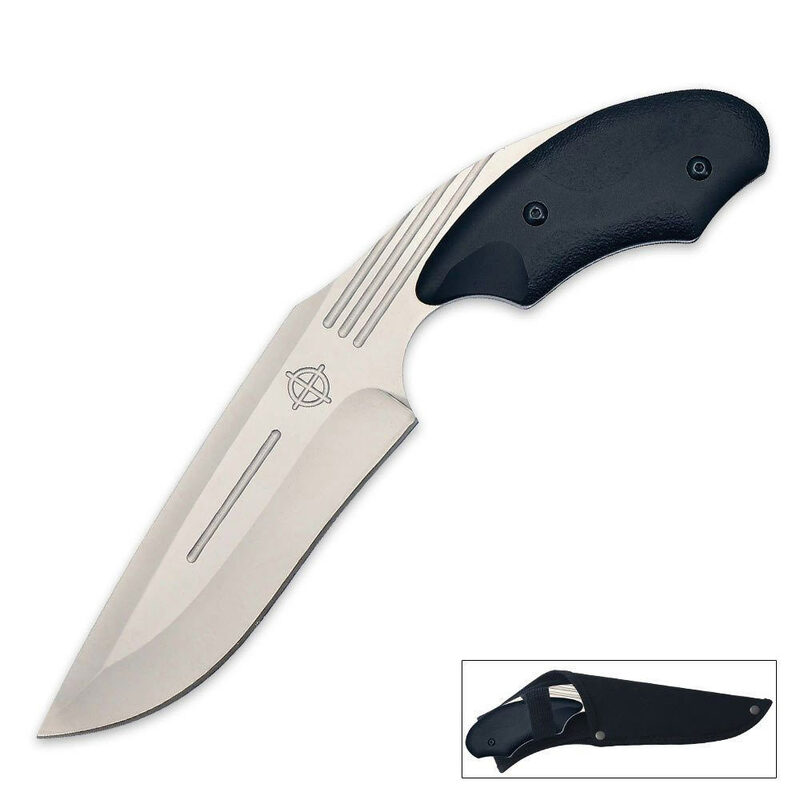 Featuring solid, thick, full tang 440 stainless steel construction, it is built to last. The textured black handle provides a secure, slip-free grip that looks like the handle of a handgun. Measures 9” overall. Includes nylon sheath. This knife is awesome for the price. I have very few complaints and a lot of great things to say. The knife is thick for it's size, something that can be nice. While the handle is thinner than most it was wide across enough to work for me (although I have somewhat small hands). It arrived fairly sharp and was easy to sharpen further. My big complaint is how the belt loop is oriented. It is at an angle with the knife handle which makes it look better in the sheath and was probably easier to manufacture. However this causes it to hang at a significant angle on the belt, making it look odd and be less convenient. Overall though it was an excellent knife. Very nice knife. Has a great feel when holding and comes out of sheath great. Don't be fooled by the price!!! This knife is worth every single penny.....and more. I don't order knives for the sheaths......this has a nylon sheath that is functional, but the knife more than makes up for the sheath quality (the sheath is adequate)! This full tang knife is one sturdy instrument. Mine was razor sharp out of the box. I have several....one to carry when needed, one in my tackle box and one in my vehicle. It stands up to everything I have used it for.....including (with a little practice)throwing. I plan to order more for a few friends.